Receive a blessing that comes for the entire world. Peace, love, all the blessings and strength for you to continue. Those who don’t have faith will not succeed. You all must truly prepare for what is coming, because what the world will go through is very hard and it’s coming very close to you. Is your family protected? Is your family cared for? Is your family already praying? Evil tries to attack more within families to separate them so they won’t have peace, nor love and neither understanding. Now it’s the moment for the families to come together, to pray together, to remain together if the world should shake. I’m making a call, it is soon, it’s on its way. Are you prepared? I don’t believe so. You must be better prepared, without skipping the prayer of the Holy Rosary, without skipping adoration of the Holy Sacrament, without skipping going to Mass, without skipping confession, without skipping coming to the apparition, without skipping prayers at the most important moments in your lives. Life is hard and it will become harder. Those who don’t believe in eternal life, those who don’t believe will enter purgatory or hell. My children, choose: Will you come with Me in the Celestial Glory or will you go through turbulence, war, calamity, suffering, hunger, screams and tears? Your knees will bend to ask for forgiveness. I ask for you to be more sincere. Love from the heart. Don’t love only with words, but from the heart. I mean that now is the moment to repent to start a new life filled with faith and love. My children, put your hand on your hearts and lower your heads. I would like to ask you: Do you know what is on its way? I don’t want to make you afraid, but I want to prepare you. Close to you, My children, there’s nothing that is well. I mean that there’s nothing that is good: There’s pain, blood, death, shaking, shots, a lot of suffering and depression. Many people live and scream in loneliness. There’s more depression and families no longer know what else to do. There’s also a lot of distrust and one hurts the other. Now is the moment to open your Bible, take your Rosary, go on your knees and pray more, ask more. I notice that many of you are stuck to materialism. Evil has taken a lot of this world. That is why, My children, be sincere, pray and truly love. If you have a sin, don’t forget, go and ask for forgiveness before all that is on its way arrives so you can also be in the row of the chosen in this world. I see many, but a few are called. I, your Mother who’s very worried for you all, am asking, I’m seeing and pleading with My Son Jesus, with all Saints and Angels in Heaven. All others who are in Heaven are also praying for you, because they do know what’s coming. I can only tell you that it would have been the last time you would’ve been able to see a lunar eclipse like the one that just recently happened. The ocean will become rough, people will become desperate, others will stamp their feet, others will shout saying they don’t have food nor money to pay debts. Buildings will shake. My children, one more time I say to you, if you have faith, faith will save you, faith will forgive and guide you. Keep on opening your arms and your hearts and surrender. I want to see who surrenders with sincerity and honesty. In this life you must be honest. Don’t give each other a kiss while you hate the person. Don’t give each other a kiss while you speak badly about the person. It’s better to help the person and to give him what he deserves rather than hurting him, because each pain you cause to a person that is by your side is an arrow through My heart and the heart of My Son Jesus. Ask for 3 wishes that are most important in this life for you. Ask what you want most for your family, for your life and for your health. Also, for you to be a unique, true, glorious, good and marvelous chosen one. I, the Virgin of Grace of Aruba, ask that the rays of My life go into your life. Is your heart hurting? Think for a moment. Did something happen that is bothering you? Do you cry when you’re alone? Are you very lonely? What is your pain? Talk to Me. I know your pain, but I want you to talk to Me with sincerity, because I’m a Mother who wants to listen to you, who wants to teach you to pray better with a lot of patience and a lot of love. I’m a Mother who wants to hold your hand to guide you on the best path. My children you know that I, your Mother, will take you with assurance to My only Son Jesus. You all want that? Do you love My son Jesus? Do you know that He died for you for pure love? Every hit of the whip, each pain, each cut in His head He took for you. I, who have seen My Son suffer, want to prepare you for the sufferings that are on their way, which are symbols of what My Son Jesus went through at Calvary dying for pure love. He didn’t scream, He only asked a blessing for your salvation, so that you could go through moments of miracles and difficult moments would become soft in life. Believe, ask and you will receive. 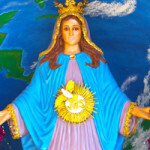 I, the Virgin of Grace of Aruba, offer you My love, My goodness and My grace. Do you believe that? My beloved children you must feel hurt because your past wasn’t good. That is why I want to help you to repent for all your past, of you bitter life; the bitter taste like the sponge that was put at My Son Jesus’ mouth. You who are here have gone through it, but now I offer you the love that is infinitely merciful and good through the Precious Blood of My Son Jesus. His Blood will leak, I mean that it will leak on your heads. My children always say, “Jesus, I trust in You”. Through your trust, My Son Jesus will surely protect you of what is coming, because of what you announced with your mouth and your heart. I assure you that those who have said “I trust, I believe, I repent and I ask forgiveness”, know that today you are blessed and assured. Put a smile on your face and in your heart. Be content, be happy and say ‘Yes’ to help Me and My Son Jesus, the Angels and Saints. Trust, because We are loved in the middle of the miracle of this 25th evening, which is the first apparition of 2019. Long live the Creator, who’s My Son Jesus, the King of the World and the Universe! Hug one another and say thank you from the heart for coming today to the apparition which is very great and important. Every day the messages prepare you more and more for the union within your family. Don’t ever separate from your family.